I’ve been in a little bit of a blogging slump. Other than a link to a cartoon, I haven’t posted anything in a month and half. As I mentioned previously, I’ve been spending a lot of brain power on work lately (hopefully that will be calming down in a month or two), and consequently haven’t really sat down to write anything. I’ve opened WLW a dozen times to write something and started at a blank screen forever (or at least 15 seconds) before giving up and closing it. Well, at the advice of another blogger, today I’ve decided to post a list. I actually wasn’t going to post anything at all, but as I was looking around my desk I noticed that I had a few things on my desk that many other developers might not have. I thought about it for about 3 seconds and realized, “Dude!” — remember, I’m originally from California — “This would make a totally awesome list post!” Four more seconds later I decided that while the post might not be “totally awesome”, it would be fun for me at the least. #1 — Francisco. 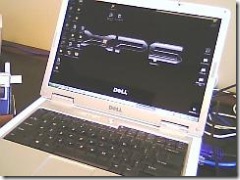 Francisco is my trusty Dell XPS M140 laptop that I got about 19 months ago — that makes him middle-aged in computer years. A similarly equipped machine is now available from the same manufacturer for approximately 30% the cost I paid for Francisco, but our relationship is deeper than that. It’s not all about money, you know. And although he’s been feeling a little under the weather lately, and generally acting like someone suffering from some sort of bipolar disorder, we’ve been through a lot together, and have a strong bond. Really. So anyway, you may be wondering, “Is Scott using his personal computer for work?” Yes, I am. Let me know if you’re wondering anything else. 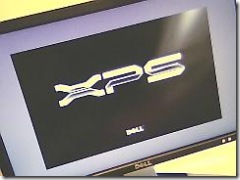 #2 — The 20″ Dell display. So I wanted to continue on for a moment with that thought you were having about me using my personal computer at work. I work at a startup company, and as you may be aware, it’s not 1999 anymore and I’m not in the Bay Area. As a result of the way the time-space continuum works, we are not funded with millions of dollars to spend on things like launch parties, massages, swanky lunches and high-end computers. Well, at least not at the beginning. I do have now (as of a month or two ago) a new Dell desktop somewhere in this office building. It’s just waiting for me. Every now and then I go out to the warehouse to make sure it’s still there, but I haven’t been able to take the time to set it up with all of the software I need to be productive. 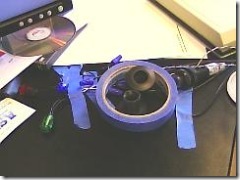 So, in the meantime, I decided I might as well not let that 20″ monitor go to waste, so I plugged it in to Francisco. So there you go. The people in the second group are just liars. But I forgive them because I’m sure they wouldn’t want it to get back to their kids that they thought my kid was cuter than theirs. #4 — A top secret drawing. I can’t tell you what this is, or I’d have to… you know. Actually I almost forgot what it was myself. It’s a good thing I didn’t forget because it’s very, very important. As you might have guessed, I’m not a good note taker. The only things I write down are things I would probably remember anyway. That and a lot of doodles. I personally a fan of the spiral scribble and the sine wave. Yes, the sine wave. It’s the only thing I remember from my 11 years (actually about 5 years with a lot of breaks in between) and untold thousands spent on my degree in Applied Mathematics. I used to wonder why they called it a B.S. degree. #5 — My new patented “Memory Replacement”. This might not be a “Standard” yet, but trust me: it will catch on like wildfire and will be popping up on desks across the globe. 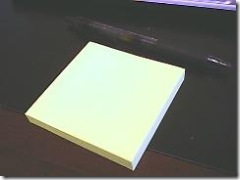 To the uneducated and uninformed it looks like a simple pad of sticky notes and a pen. Not so! Recent research efforts have proven this handy little invention of mine to be an effective memory replacement for those of us who suffer from ultra-short-term memory loss (USTML). USTML can be caused by a variety of factors, including fatigue. Scientists don’t yet have a cure for USTML, but the Memory Replacement can help alleviate the side effects. Be sure to consult your physician if side effects continue or if your Memory Replacement causes aches and cramping in your wrist. 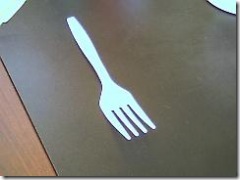 #6 — A plastic fork. Not typically a “nonstandard” item, but I haven’t eaten anything with a fork at my desk at all in recent memory. I think I can remember how it found its home on my desk, but it’s just weird. I mean, think about it, who has a fork on their desk? Just sitting there? I’m not sure how long I’m going to keep it. It’s not like I have any emotional attachment to it or anything. I haven’t given it a name or showed it to any of my friends (aside from this blog post, that is). #7 — A cool projectile toy. 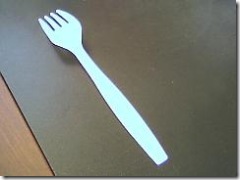 No, it’s not a fork, people; it’s a cool projectile toy. I can’t read Chinese, but the package says it’s called . As you can see from the concave shape of this toy, a simple tap of the fingers on the elevated portion will cause this toy to fly into the air. With practice you can learn to launch this toy straight up and back down into place, or you can hit targets up to 3 meters away (I guess they use the metric system in Taiwan — that’s, like, 3 feet in American). The manufacturer recommends against trying to hit human targets, but, seriously, where’s the fun in that? 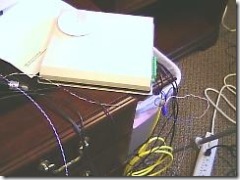 #8 — An empty Live Cam box. What do you think I’m using to take these pictures with? Telepathy? A 5+ megapixel camera? My cell phone? Yeah right! Those are for losers! I use this fine piece of hardware that is currently set to take high quality photos at 240×180. It is a very versatile camera and it can be used to take pictures of computers, forks, toys, other pictures and even people. Try doing that with telepathy! 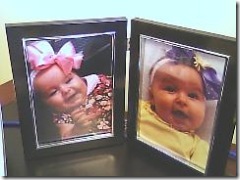 You may have noticed there is also a high-end power strip in the frame with the Live Cam. My work gave me that as a gift. I use that power strip to not only supply power to Francisco and the 20″ Dell monitor (see items 1 and 2 above), but also as a spacer between my desk and the wall. I’m thinking of a ridiculously sigh-and-eye-roll-inducing play on words about table layout and spacer gifts (GIFs), but I’ll keep it to myself. #9 — A QuickCam. What’s this? Another camera? Yes, but this one is still in it’s box. I’m sure there are many differences between this camera and the Live Cam. 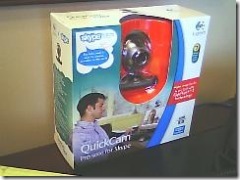 First, this one is called QuickCam instead of Live Cam. 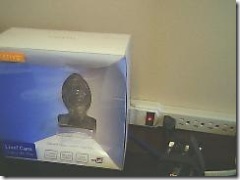 2 – this one is still in the box. C) the QuickCam cost us about twice as much as the Live Cam and it is a round ball shape instead of a vertical-half-an-egg shape. In reality, this one is there to make sure that the application I’m working on works just as well with this camera as it does with any other camera. So far so good as long as I remember to install the camera drivers. 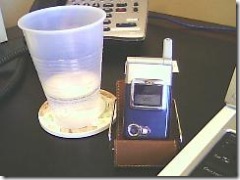 #10 — A cup of water and a cell phone in a cell phone recliner. I actually like to drink water a lot, and fortunately for me at work we have a reverse osmosis system hooked up to the fridge, so it’s like unlimited, free, good water. Woo hoo! Next, as you can see, my cell phone has a nice comfy little recliner to relax in while I work my fingers to the bone. Yeah, I want my phone to be comfortable and all, but I have to admit that sometimes I see its smug little look while it’s sitting there in its fancy schmancy little phone recliner and I just can’t take it anymore. Stupid arrogant phone. I used to have the same problem with my iPod. Everyone knows that Apple products are cocky and arrogant to begin with, but give them a cushy soft papasan, and they take it to a whole new level. Let’s just say I can’t find that iPod papasan anymore. A roll of ultra-high quality, blue, single-sided adhesive paper. Some mounting brackets for certain types of sensors. A DVD a co-worker lent me to watch in my spare time. #12 — An RFID reader. More work stuff. This thing is an RFID reader. That means it reads RFID. But not just any RFID, it reads passive, UHF, Class 1 Gen 2, EPCGlobal compliant RFID tags. Yeah, but the impressive part is that yellow cord hanging out of the side of it. That thing is awesome. It makes it so much easier to switch between different types of sensors. Previously, testing new sensors meant unwiring the current one and rewiring the new one, trying to remember which wire goes where. Fortunately most sensors use the same color scheme for wire colors, however, it was still a pain. Now we only use sensors that support this quick connect cable and life is easier. It kind of makes me wonder why we didn’t try this sooner. #13 — My whiteboard. OK, yeah, this isn’t really on my desk. In fact, it’s behind me as I face my desk so it’s on a completely different side of the room. I just decided to include it so that I could have a bonus section. I always wanted to have a reason to have a bonus section in a list. 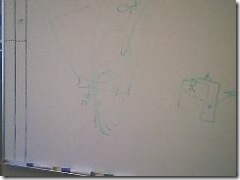 Anyone care to take a guess at what is represented by the drawing on the board? 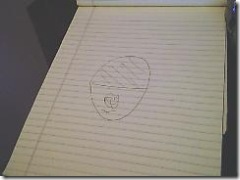 Of course, I will be neither able to confirm nor to deny your guess as this is also top secret like the notepad above. You’ll just have to think about it and wait until I’m a multi-gazillionaire before I can let the secret out. So, there you have it. I blogged. It’s a list. Maybe we can make this into one of those crazy blog meme things. You know, kind of like chain-letters-for-blogs where people talk about things they’re going to do in the next 6 months to become a better developer, or post the results of some survey that tells them some revelationary fact about themselves in terms of cartoon characters, and then other people do the same thing, and so on. What do you say? What things do you have on your desk? Or you could just read this and forget about it. Your choice. Disclaimer: I make words up. I constantly add new words to my spell checker because it doesn’t like them. Words like revelationary. Sorry.